It is the digital era and the internet has proven its worth to many companies’ successes. These include marketing, recruiting, selling and public relations. Creating a web image does not merely entail explaining your business but following vital steps to come up with a quality website for your business. A great website will attract more visitors who turn into clients and eventually materializing into high revenue for your company. The digital age demands that businesses, especially startups, establish an online presence. This can be in the form of a website, an e-commerce platform or a page in the social media forums such as Facebook, WhatsApp or Instagram. For maximum benefits, it is advisable that a business combine the trio in reaching their audience. 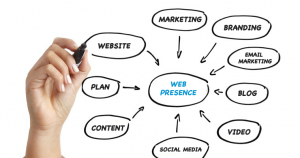 An online presence is an essential tool for every business that wants to reach both its existing and potential clients. Web presence increases the revenue you carry back home because of the following attributes of the internet. The internet provides an easy and affordable means for you to reach your clients. Businesses can reach a wider audience than when they use other sources of marketing. Businesses can connect with their customers in a fun and exciting way through the internet. Honest reviews, testimonials, and feedback from customers can be shared through the company’s website. A company can actually sell their products and receive payment through a secure section on the website that allows for the transaction. The above benefits of taking your business online substantiate the increase in clients which means more sales and revenue for your company. With over ten years of experience in the industry, we have a proven track record in matters of creating and maintaining an effective web presence. With our services and products, we can help you arrive at that landmark that you have always desired as a firm, and beyond. Helping you understand your clients’ tastes and preferences. Marketing your business to your current and potential clients. Promoting new products, services, and offers. Informing your potential clients on how they can reach your business and obtain your services. A good web presence allows small businesses to compete favorably with bigger and established market players. This is because they can reach a global client base and maximize their business potential. Through our web development and search engine optimization services, we will help you reach a global audience effectively and in a convenient way for both parties. We understand that small business may not have adequate resources needed to promote their products and services. Internet usage has increased thanks to highly affordable internet-enabled gadgets. Your next client is probably browsing the web at the moment trying to find the services or products your company offers. Without a great web presence, you are going to miss out on this customer, hence no revenues. With an online presence, you are sure to capture such opportunities resulting in improved revenues for your company.